Red Tiger’s Dark Jungle, released back in April 2018 takes the jungle theme and puts the awesome Silverback Gorilla front and centre in a beautifully animated slot with a 5x4 reel set, 40 pay lines and an RTP of 94.79%. 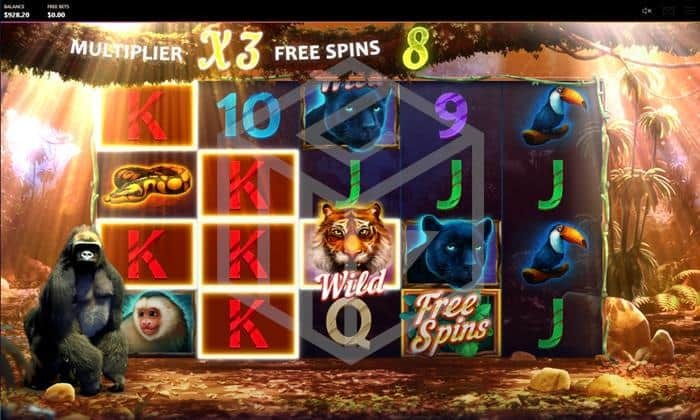 Both the base game and the exciting free spin round feature the might of the Gorilla where some big gains can be made from this high volatility slot which can be played from €0.40 to €40 a spin. The backdrop to Dark Jungle is an awesomely detailed jungle scene with tropical plants, shrubbery, rocks, and thick vines covered in vegetation, all dimly illuminated from the half-light which has managed to pierce the canopy from the tree tops above. The game board is framed by a familiar jungle slot wooden frame entwined with foliage with all symbols sitting on a navy blue, translucent background. The lower value symbols are the standard 9, 10, J, Q, K, and A while the higher value symbols are represented by a toucan, snake, monkey, panther, and the Tiger wild. The Tiger wild is the highest paying symbol, awarding 12.5x the bet size for 5 on a pay line. There is also a free spin scatter. 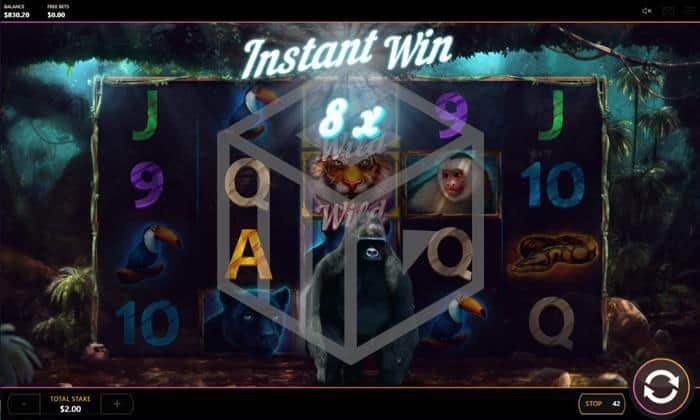 The huge Silverback will occasionally appear as a symbol on the middle reel during the base game as well as stomping on to the screen to shake things up during the free spins (more of which later). The special features are all about the Gorilla. In the base game his mere presence on the reels means a winning spin and in the free spin round his violent outbursts can lead to some hefty wins. The simplest of features is the Gorilla Instant Win. On the odd occasion (not very often at all, however) a Gorilla symbol will appear on the middle reel. When it does you can expect an instant win of up to 50x the bet size. Land the free spin scatter on reels 2, 3, and 4 and you will be awarded 9 free spins with what is called a ‘Progressive Lock and Re-Spin’, and this is where the real money lies. If any win lands during the free spin round the winning combination will lock into place whereupon the remaining reels will re-spin. If during that respin another symbol adds to that win then it will also lock in place and another respin will be granted. Also, for every respin the Silverback standing to the left of the game board will pound his huge fists on the jungle floor which will add a 1x multiplier to the eventual win. The locking respins continue until no further symbols which land add to the win. Then the total win will be subject to the multiplier before continuing with the regular free spins. The free spins can also retrigger, and if any free spin scatter lands next to a win it is also held in place for the resulting respins. Dark jungle is an attractive, well thought out slot with a killer free spin round which keeps you coming back for more. It may be quite a high variance, and you’ve got more chance of seeing bigfoot than you have of getting that Gorilla in on the middle reel for 50x bet size, but the stacked tiger wilds fall often enough to keep you relatively entertained in the base game. Let’s face it though; this game is pretty much all about those free spins. The excellent sticky wins combined with the Gorilla multipliers can reel in some truly epic wins – at least that’s what we found during our test phase. Add to this a better than average design and some atmospheric sound effects and Red Tiger have got themselves a great all-round package.